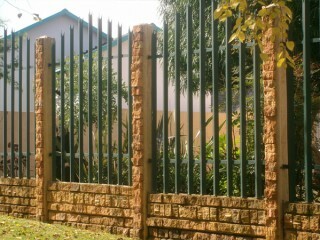 It has become a part of our lives here in South Africa to make sure we have good boundary walls, not only for their aesthetic appeal, but as an added security feature. As crime escalates at an alarming rate, we all need as much security protection for ourselves and our families as we can get. Good quality boundary walls are a must, with added security. Whether we have palisades or concrete walls, we need to plan carefully, before deciding which would be our best option. Solid walls are great, and, very pleasing to the eye, and of course ensures we have privacy, but there is one drawback. We erect high solid walls to get privacy, but we are then giving criminals privacy too. Once inside our property, they cannot be seen by anyone from the streets, or by neighbours, and can move about without fear of detection. A good option, therefore is facebrick walls with steel inserts. We would still get a mode of privacy, but the steel inserts will ensure that, should an intruder be on our property, they would not be able to move around without detection. For over 25 years, Country Wide Walling has been in the walling industry, and through experience have developed an exceptionally strong, quality precast facebrick wall, which is manufactured by them, and then good, quality steel inserts added, to give their clients an exceptionally high quality product, which outlasts any of their competitors. Their workmanship is of the highest quality possible, and the end result is an aesthetically beautiful product, with privacy and security, which will last for many years. The walls surrounding our property demarcate the boundary of our property, and if it is of high quality and workmanship adds an aesthetic quality which enhances the value of our property. Usually people first consider security, then privacy when deciding on enclosing their property. The facebrick wall with steel inserts meets all requirements, from privacy to security to aesthetic appeal. Why not contact us today to discuss your requirements, and we will come out and give you a free quotation.